Okay, so once again I'm reviewing a pretty cheap wine and once again, I've poured myself a slightly overfilled glass. Not too long ago I reviewed the Rex Goliath Free Range Red wine (link is here) which I found a bit underwhelming. I was hoping their Shiraz would fare better, so I bought another bottle with that giant 47 pound Texan circus rooster and saddled up. The rooster on the label is of a giant rooster that was in a circus in Texas. Why a California winery chose this as their icon? And for a wine, no less? I haven't a clue. The Rex Goliath Shiraz pours a deep purple and smells of blackberries and oak. Tasting brings surprisingly dry raspberries, plum, black licorice, and a good deal of oak. The finish is short, yet smooth, with relatively mild tannins. This really isn't a bad wine at all. And for the price ($5), it's a pretty damn good California Shiraz. 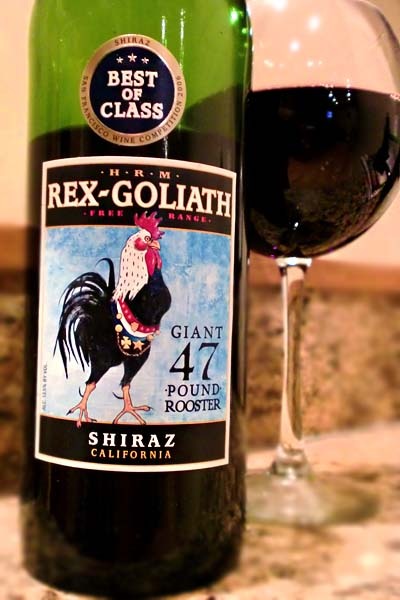 Overall, the Rex Goliath Shiraz is considerably better than their Free Range Red. Rex Goliath, you have redeemed yourself! *For other Shiraz reviews click here. There are also a few write-ups about the differences (or lack thereof) between Shiraz and Syrah. Drink This: if you want a well above average Shiraz around the $5 price point. This would easily make a good everyday type of wine. Don't Drink This: if you're looking for a cheap, sweet red wine. Like I said in the tasting notes, this was surprisingly dry, especially for a budget wine.